As of this day (December 27), we are approaching the December 30 date whereon in the year 1953 the first commercially available color television set - the Admiral C1617A - went on sale. Mac McGregor and his repair shop technician, Barney, had been servicing color TVs since at least February 1955 as printed in a Radio & Television News story titled, "Barney Takes on Color." 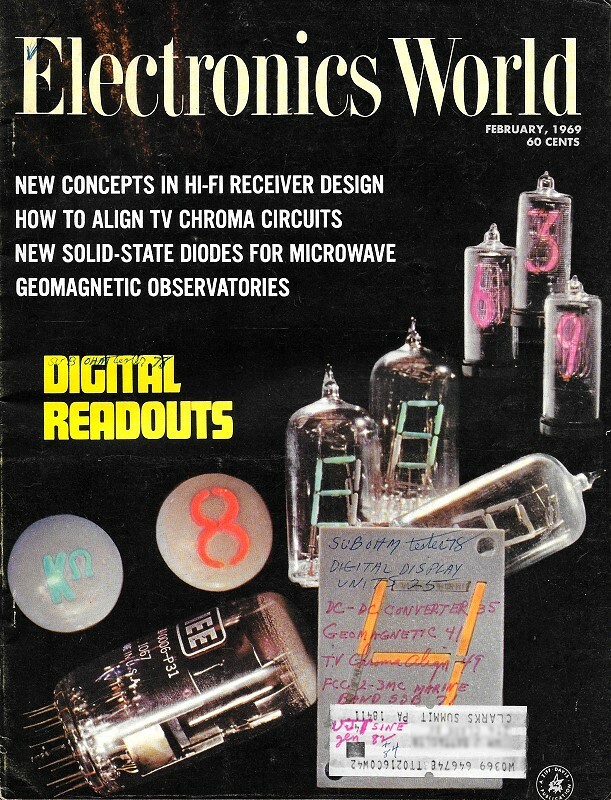 This particular edition laments the increasing cost of servicing color television sets as they get increasingly complex. Mac and Barney agree that one of the reasons for service cost is having to work with the newfangled printed circuit boards. Those early PCBs, even though most were only single sided or double sided, the metal traces and component solder pads easily separated from the substrate, especially when people were trying to use the old kilowatt soldering irons to work with point-to-point wiring which terminated on solder posts or lugs. Switching to a 25-watt iron with a small tip greatly reduced the incidence of lifted pads. Like all other technological advances, it just required the passage of time with a commensurate amount of trial and error to get things right. The TV industry tried integrating plug-in modules that would be swapped out to get the set functional quickly, but that trend had just begun when this article was written so there wasn't any empirical data to measure the success or failure of it. As I have mentioned many times, these stories were actually reports on the state of particular parts of the electronics industry. By providing built-in serviceability, set makers can reduce the soaring cost of color-TV repairs. It was a pleasant February day, both inside and outside Mac's Service Shop. Outside the brilliant sun had nudged the mercury up to nearly 50 degrees - the warmest it had been since last November. Inside Mac and his assistant, Barney, were enjoying the rare experience of having every single set in the shop repaired, ticketed, and ready to go. They chatted back and forth contentedly as they cleaned up the bench, wiped off the instruments, and racked up the tools. "Mac," Barney said, "a little while back I read an interview with Joseph C. Duncan, national customer service manager for the J. C. Penney Co., in which he said that according to an industry estimate the owners of color-TV sets spent some $400 million on repairs in 1968 and that this annual color-TV service bill would zoom to $4 billion within the next ten years." "Sounds good for the color-TV service business." "That is not exactly what he had in mind. He feels that within five years these skyrocketing repair bills will begin to clog sales, and if that is allowed to happen, everyone in the color-TV business will be adversely affected." "Does he consider color-TV service charges excessive?" "He didn't seem to be criticizing the service technician as much as he did the color-TV manufacturer. He said poor chassis layout and allowing manufacturing cost considerations to arbitrarily dictate component location and fabrication techniques were major factors in the high cost of color-TV service. Test points are often buried so deep inside the chassis that they require considerable labor to reach. Other components, such as transistors, are soldered into the circuit so they are difficult to remove for testing or replacement without damage; and when a new unit is called for, it is likely to be damaged in soldering it to the circuit board." "He'll not get an argument out of me that way," Mac stated. "You know what a rare and pleasant surprise it is for us to find transistor sockets in any present-day electronic equipment. When this does happen, we feel a warm wave of gratitude to the engineer who designed the equipment. Be obviously expected his brain-child to last long enough to need service eventually and to be worth repairing - two considerations that obviously played no part in the design of much of the stuff that crosses our bench today. Does .Mr. Duncan have any suggestions as to how color-TV repair costs can be lowered?" "Quite a few. He wants all TV sets designed so test points are clearly called out and easily accessible. He estimates this would add only about 50¢ to the cost of manufacturing a set. He also thinks transistor sockets should be used. This, he admits, would add a few more dollars to the cost of the set. "But he doesn't stop there. He believes a special, easily accessible panel should be developed that would connect to all important test points and permit a malfunctioning circuit to be quickly located by current and voltage measurements or waveform analysis made right at this test panel." "I should imagine he would react favorably to Motorola's new Quasar chassis. You know that's the one using only one vacuum tube (the picture tube) along with 68 transistors and other solid-state components. It employs ten plug-in component boards, each of which is removable and can be re­placed as a whole by the service technician." "You're right; but he thinks this module concept should be carried still further to include an indicator for each module to show if it is functioning properly. How does that strike you?" "Not quite so favorably. Making color-TV sets easier, quicker, and less costly to service is one thing; trying to build them so the customer can do his own servicing is something else. Encouraging the customer to believe he can successfully and safely service something as complicated as a color-TV receiver is about as practical as publishing a book on 'Brain Surgery Self-Taught.' You and I both know that designing an indicator to signal a significant deviation from a normal waveform would be both complicated and costly. Equipping each module with a reliable trouble indicator-and a trouble indicator is worse than useless if it's not reliable - would add a prohibitive amount to the cost of the receiver." "I agree. You can justify just so much extra cost to make a receiver easier to service; from there on you're defeating your purpose. Dr. Duncan apparently knows that, but he argues that not all the increased set cost would have to be passed on to the consumer because warranty service costs to the dealer would be less expensive." "That's true, and I hope color-TV manufacturers were listening to Mr. Duncan's comments. Zenith, as you know, has talked about the serviceability of their hand-wired chassis for a long time. Now Motorola has joined them and talks freely about trying to make their color-TV receivers easier to service: I'm glad to see these two companies have the courage to try to sell 'serviceability,' and I hope other manufacturers join them. Admittedly, it takes courage to talk about the possibility that the product you are trying to sell requires repair. That is not a pleasant thought for the customer to have in mind when he is shopping for a color set. The salesman would prefer that the customer thought only of how much he was going to enjoy his receiver watching the Rose Parade or 'Laugh-In's' bikini girls in living color. "Automobile manufacturers went through much the same thing. For a long time they argued that people wouldn't buy safety, when actually they were reluctant to suggest, even indirectly, that their customer might be involved in a crippling or fatal accident in the chromed beauty they were trying to sell him. It was 'bad sales psychology' to bring up such a distasteful possibility. But once public opinion and the government forced all car manufacturers to include basic safety features, they discovered that talking about safety didn't frighten away customers at all; and now they actually compete with one another in telling about how much they have done to make their products safe. "And right now it looks as though they, too, may be forced to give more thought to the serviceability of automobiles. Designs that make necessary excessive costs for replacing easily-damaged parts are under investigations, along with new-car warranties, and out of these investigations may well come further government regulations. TV set manufacturers might do well to take heed. "Strictly speaking, now is an excellent time for the color-TV set manufacturers to do some soul-searching and head-scratching on this matter of making their products easier and less-costly to service. We are just on the verge of a whole new line of solid-state color-TV receivers; so what better time could there be for designing more serviceability into this new breed of receivers?" "Yeah man!" Barney agreed, "and I think a darned good place to start would be to include sockets for the transistors and the IC's that will go into those receivers. Not long ago I was reading where Gerald F. Hunt, vice-president for new products of the Cinch Manufacturing Co., estimated that 10% of all IC's are now socketed and that there is a significant trend toward the use of still more sockets in areas where the IC's will need replacement. Beyond a doubt, that will include color-TV receivers. Here's hoping the manufacturers don't solder those 14-contacts-plus directly to the circuit board!" "Amen!" Mac seconded. "Actually I wonder if maybe the military may not be pointing the way toward color-TV servicing in the future with the automatic testing equipment they use to keep vital communications and avionics gear in top operating condition. I'm thinking of the Navy's Versatile Avionics Shop Test (Vast) system; the Air Force's General Purpose Automatic Test Sets (GPATS); and the Army's Depot Installed Maintenance Automatic Test Equipment (DIMATE) and Land Combat Support System (LCSS)." "Well, the DIMATE system is typical. A magnetic tape directs DIMATE's pre-programmed computer which operates signal-generating and signal-detecting instruments to compare actual and ideal test results to determine if the unit under test is working properly. If not, DIMATE prints out a description of the malfunction. Recently equipment of this kind was used at the Sacramento Depot to check out some 1000 Vietnam-bound walkie-talkies in an average time of 8 1/2 minutes per set. It takes a skilled technician 1 1/2 hours to check out one of the transceivers." "Hey, you're surely not suggesting every service shop should have one of these little DIMATE gems that probably take up a couple of Army trucks and cost several hundred thousand dollars!" "You're low. The cost is between two and three million dollars. Of course I'm not suggesting anything so elaborate as that. What I do have in mind, though, is that the basic principle might well be applied to color-TV servicing. If the manufacturers will get together now and decide upon some standardization in the location and marking of circuit test points - both for signal injection and signal pick-off - and if these test points are either brought out to a standard test panel or are made readily accessible so that such a panel can be quickly connected to all of them, then it would not be too difficult to design a compact signal-generating and signal-detecting battery of instruments that would plug into that panel and at the dictation of a simple, versatile programmer, say a punched tape, would test all the circuits of the TV receiver in proper sequence and reveal to the eye of the the technician exactly what circuit was malfunctioning. " "I know it could be done," Barney said enthusiastically. "For people who have worked out all the tough problems that had to be overcome to produce color-TV as we have it today, designing such an automatic test set should be duck soup." "I feel we should say one thing before leaving the subject," Mac concluded. "Up until now color-TV manufacturers have been chiefly concerned with trying to get the cost of their sets down until almost everyone could afford a color receiver. If, in their determination to do this, they have ignored the problem of serviceability, this can be understood. But now the fear of high service costs is beginning to be as much a detriment to sales as is the initial cost. This is a good thing to ponder - but not for too long!"